Over the past 25 years, Creative Dance Academy has excelled in producing professional performers throughout the entire Dance Industry. Children develop and improve at different rates depending on their age and body structure. Dance Classes are structured to allow teachers to spend quality time with each student working on his or her individual needs. Creative Dance Academy has a strict class size policy so as not to impede on any students needs. Creative Dance Academy produces excellent technical jazz performers due to our disciplined classical training. Students of the Academy are tutored in all genres of jazz dance including hip hop, street funk as well as the more technical Broadway style. All Academy students are taught at least 1 style of jazz depending on their age & capabilities. Creative Dance Academy has a fantastic stretching method which instills a body awareness & safe dance practice in all its students. Find out more about our jazz dance classes. The students of Creative Dance Academy are trained in the Les Griffith Tap Dance Academy syllabus (L.G.T.D.A) which is the most challenging & most exciting tap syllabus that Australia if not the world has to offer. This syllabus has produced musicals such as “Hot Shoe Shuffle” & “Tap Dogs” which are now highly acclaimed on Broadway & London’s West-End stages. Creative Dance Academy has a 25 year 100% pass rate in all tap examinations with most students achieving marks of Distinction. There is no other dance school in NSW that can boast such excellent results. Examination students are also given the opportunity of attending annual workshops. The students of Creative Dance Academy are trained in the Royal Academy of Dancing (R.A.D.) syllabus for both grade & major examinations. The R.A.D. is the most widely recognized classical ballet syllabus in the world producing the best technical performers in today’s Ballet companies. Classical ballet examination syllabus classes start from the age of 6 years & upwards. Students are put into a graded class depending on their age. Creative Dance Academy provides classes in every grade from Pre-Primary through to Major grades of Advanced. Having such a strong basis in classical ballet ensures that the students of Creative Dance Academy have an extremely high standard of lyrical & contemporary technique. The modern expressive syllabus taught enhances each students own musicality & natural emotion for lyrical music. The art of contemporary dance produces a strong controlled dancer with a keen concept of phrase changes in a musical piece. The Acrobatics class is a fun dynamic lesson based on the current style of today’s gymnastic lifts & tricks. With the class being conducted by teachers who are currently in the professional dance arena. Creative Dance Academy introduced the Acrobatics program to offer all our students safe acrobatic techniques that will coincide with & enhance their overall dance performance quality. Creative Dance Academy is very excited to have Drama as part of our performing arts curriculum. Drama provides students with opportunities to gain confidence in their own abilities especially when communicating verbally as well as non-verbally. Drama develops in students a sense of aesthetic understanding and assists them in exploring emotion and group work strategies. MINI MAGIC: This class is structured for 2 to 5 year olds. Students enrolled in this class will learn early appreciation for jazz, tap & classical ballet as well as miming & character work. Toddler dance classes are all choreographed around age appropriate music such as High 5, The Wiggles & ABC Soundtracks. DANCE&FUN – JUNIOR: This class is structured for 6 to 10 year olds. Students enrolled in this class will learn genres of jazz, tap & lyrical as well as an introduction into funk & hip hop forms of dance. Junior classes are all choreographed around age appropriate music of up-to-date modern variety. DANCE&FUN – INTERMEDIATE: This class is structured for 11 to 16 year olds. Students enrolled in this class will learn dance technique in jazz, tap & lyrical as well as all street dance styles of hip hop & funk. Teenage classes are all choreographed around current top 20 styles of music & are designed to motivate body awareness & fitness levels. 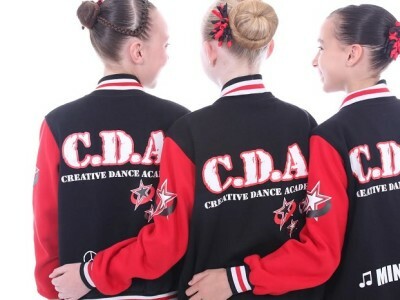 Creative Dance Academy is renowned for producing fantastic productions of the musical theatre genre. Students of the Academy are taught the art of performance & capturing an audiences attention. Learning & performing musical pieces such as Cats, Crazy For You, 42nd Street, Footloose, Grease, Hairspray, etc… provides students with the opportunity to combine their vast dance knowledge with both drama & vocal abilities. Creative Dance Academy ensures that students have an entire musical theatre experience by having authentic costuming, make-up & hair of the musical that they are performing. Many past & present students of the Academy have performed in the professional arena of musical theatre in musicals such as Oliver & Billy Elliott. This proves the high standard of performing arts taught at Creative Dance Academy. ELITE TROUPE : These classes start from the age of 3 years & upwards. Students are selected for these classes based on ability & vacancies within that class. Creative Dance Academy provides Elite Troupe lessons for every age group from 4/Under through to Open Age. Elite Troupe teaches children how to learn & perform as a team member, great memory recall, good sportsmanship, adaptability, precision, performance value, & confidence as well as creating lasting friendships & wonderful memories. Students enrolled in these lessons will learn competitive levels of jazz, tap & modern expressive & will compete with routines of every genre at local eisteddfods. ELITE PRIVATE COACHING: Elite Troupe students are eligible to begin these lessons from as young as 3 years. Students are selected for private coaching based on ability & vacancies for that particular year. Absolutely outstanding. We have tried other dance schools in the Hawkesbury area and my daughter lost the passion to dance until she joined the CDA family. She is now achieving dance results she never thought possible, and this is due to the academy’s family, energetic and fun filled environment. Their commitment and dedication to all their students, whether they be novice or experienced is second to none. Thank you Creative Dance, from one family to another. My daughter has been with Creative Dance Academy for 14 years now. She has benefited tremendously from the physical, technical, social, and disciplinary experience. She feels as if she is part of a family rather than just a student. All her school buddies envied her great posture. Would recommend the academy to anyone seeking great dance tuition and fantastic tap dance techniques. It has been a great life experience for all of us! LOVE, LOVE, LOVE CDA! It boasts a great, fun, friendly and nurturing environment for all the kids as well as the parents, offering multiple styles of dance to meet all kids requirements. Whether its just for fun or for competition based, CDA has it covered.